In the summer when fresh berries are bursting at the seams, there’s no better beverage than this recipe for iced tea berry sangria. Stunning as a signature cocktail for a romantic summer wedding, but just as wonderful as a pitcher shared with some close friends in the backyard. Hopefully, if you love iced tea as much as I do, you’ll be sipping this little berry beauty on the regular! Need to make sangria for a hundred thirsty guests? Click and slide the number next to ‘servings’ on the recipe card below to adjust the ingredients to match how many you’re quenching—the recipe does the math for you, it’s that easy. At its simplest, sangria is a Spanish beverage made with wine, fruit, fruit juice, and spices. That’s just the beginning, though! Sangria is so refreshing, that everyone has their own favorite version using different wine and ingredients. Besides it being a great way to enhance less expensive wine, making a pitcher of sangria allows a bottle stretch to serve more people, too. How do you make Iced Tea Berry Sangria? 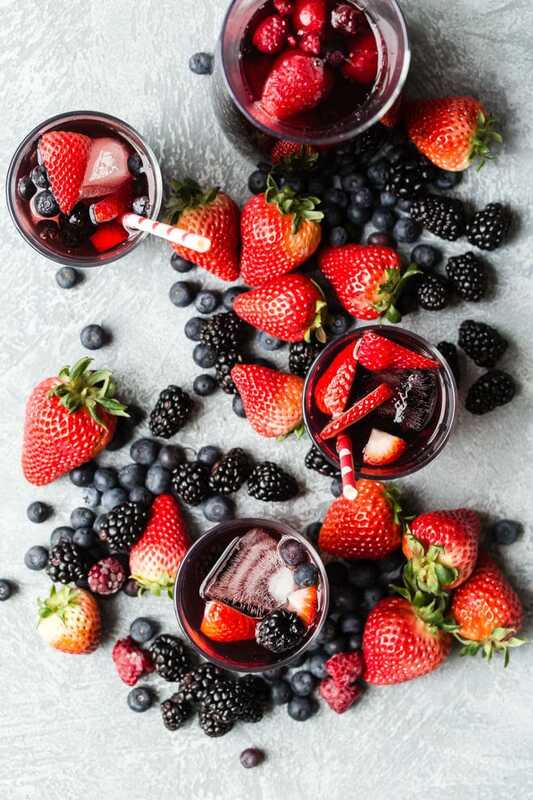 My recipe is very easy to make; simply combine your favorite iced tea, a sweeter style red wine, and berry juice together and serve over ice garnished with fresh berries. Where can I find berry juice? I look in the natural food section of any grocery store for a berry blend that will compliment the sangria. A cranberry raspberry blend will taste good, too. If using frozen concentrate, follow the instructions on the label, using iced tea in place of water. 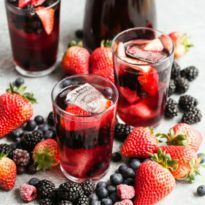 What are the best berries for Berry Sangria? Anything that looks gorgeous and is in season! I don’t worry if the raspberries are a little mashed, as long as they’re ripe and delicious. What kind of tea can be used for Iced Tea Berry Sangria? A bold darjeeling works beautifully, or your favorite iced tea blend, decaf or full-tilt. Can you make Iced Tea Berry Sangria without sugar? If you’re cutting back on sugar, use an unsweetened tea, a drier red wine, or substitute your favorite low-calorie sweetener in this recipe. What can I substitute for red moscato? Can you make Iced Tea Berry Sangria non-alcoholic? 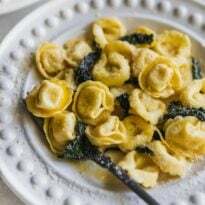 This can be just as delightful when made without the wine, substituting sparkling grape juice or a mild ginger ale for the moscato. Save this Iced Tea Berry Sangria to your “Drinks” Pinterest board! 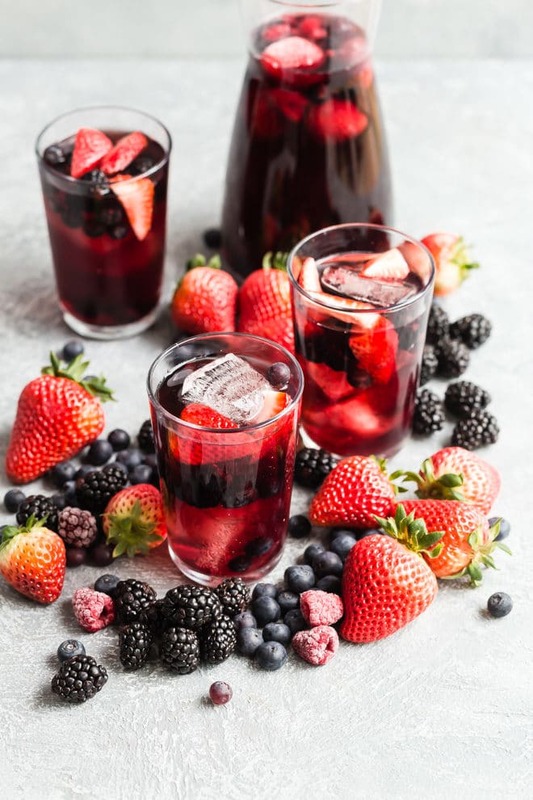 In the summer when fresh berries are bursting at the seams, there’s no better beverage than this recipe for iced tea berry sangria. Stunning as a signature cocktail for a romantic summer wedding, but just as wonderful as a pitcher shared with some close friends in the backyard. Hopefully, if you love iced tea as much as I do, you’ll be sipping this little berry beauty on the regular! In a large pitcher, combine tea, wine, juice, and brandy. Chill at least 30 minutes or overnight. To serve, add fruit to pitcher or divide among glasses. Pour sangria over the fruit. The sangria may be served over ice if desired. You and your sangria recipes are going to make me an alcoholic :) Looks lovely! Wow, now that’s what I call Summer in a glass. You could also freeze the berries first to keep the drink nice and cold. Best idea ever, Janette. You’re hired. ;) But seriously, freezing the berries (or even using some frozen ones like blueberries) is just plain common sense. Thank you for sharing your tips! You clearly know your way around a cocktail. Thank you, Kathleen! I too never thought to add berries until now, but other people make and sell raspberry iced tea or whatever (hello SNAPPLE!) so why not make this? I hope your packing is going well!! What a stunning glass of boozy refreshment! So simple and so fun to sip! What kind of berry juice? 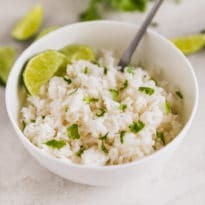 Hi Crystal, I tested this recipe with several varieties that I found at the grocery store. My favorite was the Simply Mixed Berry juice blend, although any “berry juice” would work. I think Tropicana, Welch’s, and others have options. I hope this helps! Thank you! The image looks so yummy, although I would like o make it a non-alcohol drink. How would you do that? Hi Cecilia! You could substitute more berry juice for the wine, or try using grape juice. I haven’t tried either of these so I don’t know exactly how it would taste, but I feel like there is no possible way it could be bad. I guess I would just start mixing iced tea and juice and see what you like! Thanks for the question, I’ll definitely have to experiment and get a NA substitute. Do you use unsweetened or sweetened iced tea? Hi Jennifer, I used the sweetened (sorry this wasn’t listed out, I will add it). I tested it with both kinds, but when it comes to sugar, more is more. The sweetened kind tasted best to me. Having said that, using unsweetened was still good, so if sugar is a concern for you, it still tastes good with the unsweetened. Thanks for your question. Thanks! Being Canadian, I find that making iced tea (sweetened or unsweetened) isn’t super common. I am planning on making this recipe for tomorrow – a 30th and 3rd tea party birthday party for me and my daughter! Bought some Lipton summer fruits tea and will try to make some sweetened ice tea now for the recipe.